Smithsonian Art Inventory Control Number: 47260022. Near American Legion Post 581 (375 E. Locust St.) in Legion Memorial Park on Memorial Drive, a few blocks north and east of downtown. DEDICATED BY THE COMMUNITY OF COLUMBIA, ILL.
A flat ground plaque in front of the pedestal is in memory of 90 named persons. A plaque on the left side of the pedestal is in memory of those who died in World War II, Korea and Vietnam. A rededication plaque was placed on the right side of the pedestal May 31, 1991. 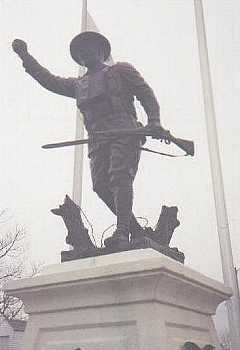 The Doughboy was originally dedicated May 30, 1924 in a small plaza on Legion Avenue, just east of Main Street. It was later substantially refurbished. The sculpture appears to be in good condition in comparison to others. Since the monument was first placed it has been moved twice. The first relocation resulted in the statue facing the old Legion building at the intersection of Legion and Metter Avenues in Columbia. On January 1, 1976 it was once again moved because that site was needed for the construction of the new Public Library in Columbia. Since that last move, the Doughboy has stood at its current location on the grounds of Post 581's Legion Park.